Beautiful You: The Best of 2014! I thought that I would write a bit of a reflective post for today because there is a lot of things that I need to be grateful for and a lot of people I need to thank for this brilliant year. 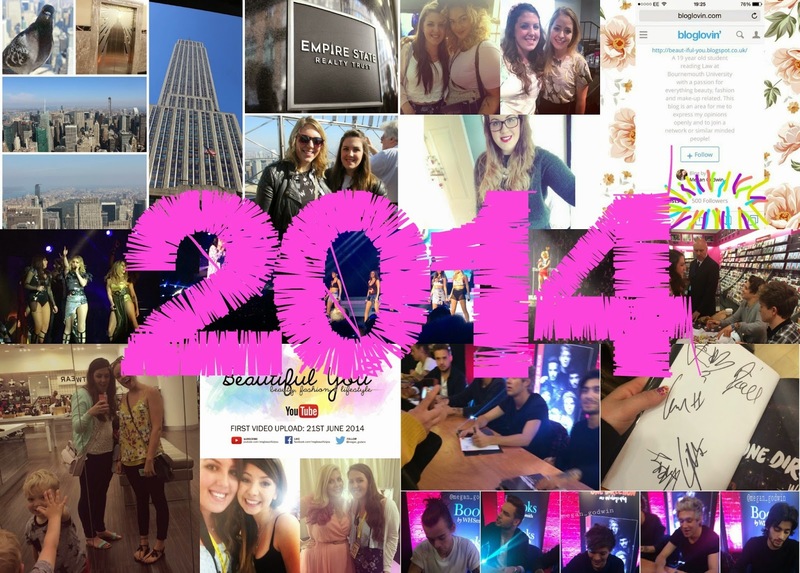 I just wanted to share with all of you my top 10 best bits from this past year and encourage you to do the same in the comments because I would love to see what amazing things you did in 2014! 10. I think this will have to be getting onto the second year of my degree. I did at one point in time question my decision of going to uni but when all the hard work pays off and you get a good grade it all seems worth it. 9. Next up has to go to me finally getting my hair ombred, I have been debating over getting this done for as long as I can remember and I finally plucked up the courage to do it. I had it done gradually as I had never dyed my hair before and I didn't know if I would like it but I am finally at the point where I wanted it to be and I love it! 8. This past year as been brilliant in terms of all of the blogging friends I have made within the community. Now that my blog has been established for a while I have made some of the best friends I have through it. I won't name them all but I have to say thank you to Becky (Angels Secrets) and Abi (Abbabubble) because without them I definitely wouldn't be where I am today. 7. I know this is clique but I have loved all the concerts I've been to this year, I have been so lucky to go to as many as I have and I cannot wait for the ones we have planned for next year. I've seen The Vamps multiple times, Little Mix, One Direction and The Saturdays just to name a few but if you follow me on twitter then I'm sure you know them all! 6. Again if you have been following me for a long time then you will know that my blog turned 1 in September of this year and I cannot believe that I have actually stuck this out and committed to something for so long. I have never felt so welcome into a community or felt to happy to be part of something before but I am glad I started my own blog. You are stuck with me for a bit longer I'm afraid but I am going to be making some changes to my blog in the New Year so you can look forward to those! 5. Another exciting thing that happen this year was that over the summer I started my YouTube channel and I then reached 100 subscribers after about two months. I never started my channel trying to make it big but there are just some topic that I wanted to talk about that would be easier to publish in video format and I wanted to be able to share over both platforms. My blog is still my main priority and I don't envision that changing in the near future. 4. Clearly meeting Zoe & Louise had to be close to the top of my best bits because I love them so much. This was the second time that I had met them both and they are the loveliest people ever. It is amazing to be able to meet two of the people you look up to when you do things the same and I have always admired them both for their channels and their blogs! 3. This only happened towards the end of the year, on Christmas Eve to be precise but reaching 500 followers on my blog has to be one of the best Christmas presents I got. I never thought when I started this blog that a year on I would have as many of you following me as I do, I just want to take a second to say thank you so much for following me and I hope you carry on following me into 2015! 2. Again, this is obviously going to be in the best bits for me but I will never forget when we met One Direction. I had said to myself that I should have taken the time to try and meet them when they were smaller because there is literally no chance of meeting them now. Oh how I was wrong and I am so happy that it happened because I can now say that I have met my fav Harry Styles and life is good! 1. I obviously had to end with the most amazing thing that happened this year and that would be our trip to New York City! I won't go into too much detail because I did do an entire blog series on it but I made the most amazing memories and did some spectacular things that I will never forget. I do have to thank my step dad for this and I will be eternally grateful for everything he did that trip. I will leave the link to the rest of the series here so you can go and have a read if you missed those posts. I hope you have all had an amazing 2014 and leave comments below as to what your highlights were because I would love to hear about them. Have an amazing New Years Eve and those of you who are of age, don't get too drunk and for those who aren't, don't drink too many J2Os. I will see you all in 2015!